Sandy's Bhutan House invites diners to explore Southern Asia. Although I didn't try Indian food until I was in college, my first taste of tikka masala was enough to fast-track the smoky, curry-based dish to my gastronomic all-star team. Luckily, Salt Lake isn't in short supply when it comes to Indian restaurants, which is a blessing and a curse. Sure, it's easy to get saag paneer or veggie samosas along the Wasatch Front, but it's also hard to really dig into the nuances of Southern Asian cuisine with so many places serving a similar menu. This is why Bhutan House (1241 E. 8600 South, 801-679-0945) needs to pop up on your radar. It serves all the expected Indian staples, but the menu also includes cuisine from Nepal and Bhutan, supplying a lot more to explore at this Sandy restaurant. While Bhutan House is fairly new—it's been open for just more than a year—its epic origin story spans thousands of miles and several decades. 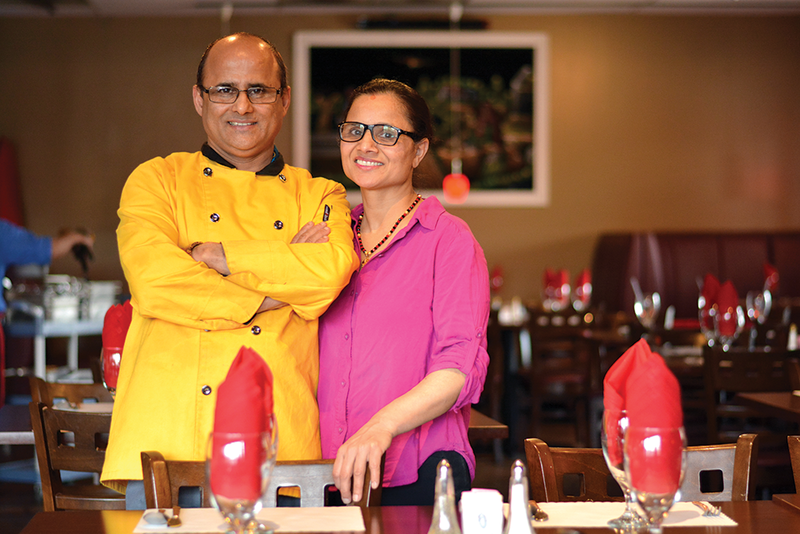 The restaurant is owned and operated by Kamal and Geeta Niroula (pictured), two Bhutanese immigrants who started their family while living in a Nepalese refugee camp. The Niroula family eventually chose to immigrate to Salt Lake City in 2010, and came across Spice Kitchen Incubator four years later. Taking advantage of resources the entrepreneurial program provides, the Niroulas opened Bhutan House in 2017. Since then, they have been serving up loving representations of their native cuisine for Utah residents to enjoy. The interior space is a great example of the Bhutanese perspective on peace and serenity. The color palette consists of burgundies and dark browns, and the wall art depicting South Asian architecture creates just enough visual interest to establish the right ambiance. It's not a large dining room, but the smart use of space makes it feel that way. As my wife and I are frequently trying to fit dinner dates into our daughter's daycare schedule, we visited Bhutan House for an early dinner on a weekday, so the place wasn't exactly packed. Visiting during the restaurant's weekday lunch buffet ($9.99), however, is a different story. The rotating lineup of menu staples like tandoori chicken, korma and various curries definitely can bring all the boys to the yard—and it's also the best way to get a crash course in Bhutanese cuisine. With a wide variety of menu items, it's no surprise Bhutan House can maintain a rotating daily buffet. Again, fans of Indian food will recognize a large chunk of the menu, and I was keen to see how their take on lamb tikka masala ($15.45) compared to other iterations I've had. The waitress was considerate enough to ask how spicy we wanted our food, which is something diners will want to take advantage of. My wife isn't the biggest fan of spicy food, but I did ask for some of their hottest sauce on the side—for research, of course. I mixed a bit of it with my food and let me tell you, this place doesn't mess around with its fiery concoctions—the stuff just about singed my eyebrows. With or without the extra dose of heat, the tikka masala here is a rich, smoky blend of spices and flavor, and the lamb complemented these flavors nicely. Bhutan House doesn't skimp on the naan—they even offer a Bread Basket ($8.95), which is like a naan variety pack. It's stocked with freshly baked slabs of garlic naan, whole wheat roti and aloo paratha, which is a delicious mix between naan and samosas. It's perfect for those who, like me, prefer to eat their food couched within a triangular slice of chewy flatbread. Venturing into the Bhutanese side of the menu, I ordered a bowl of ema datshi ($15.95), which is considered to be Bhutan's national dish. It's a veggie stew made with Bhutanese cottage cheese, peppers, potatoes and onions. While there were some aspects of the dish I liked—the cheese and stewed veggies are tasty—I also found the broth to be a bit one-note. Next time, I'll order it on the spicier side. I've shared my fondness for dumplings of all shapes and sizes in the past, so ordering the vegetable momos ($10.45) was non-negotiable. The momos here are different from those of the Tibetan variety—these are closer in size and shape to gyoza—and they're served with a tasty condiment made from sesame seeds and lots of cilantro. These dumplings didn't rate extremely high on my list—though the interior combination of cabbage, onion, cilantro and peas offered up a nice overall experience. From the inviting, serenity-inducing interiors to the flavors culled from an Eastern cultural identity, Bhutan House is a great spot for fans of Indian food who are looking to expand their culinary horizons. And any place with a lunch buffet as sumptuous and varied as this is worth a visit for a midday carbo-load.